As part of the Wong’s long-term endeavor on the unconscious relationships between sci-fi and Cantonese opera, the structure built in the exhibition departs from the oceanic landscape appearing in Tarkovsky’s Solaris (1972) and its infinite horizon of islets. In this work the vortex of space conquest collides with the vortex of antiquity, becoming a site where a Chinese sci-fi plot is imagined. Singaporean artist Ming Wong’s incredible tunnel installation Windows on the World (2014). As you walk into the Kubrick-esque ‘tunnel’ (fashioned out of wood and fabric), dotted with translucent portholes, the soft strains of Cantonese opera grow louder. 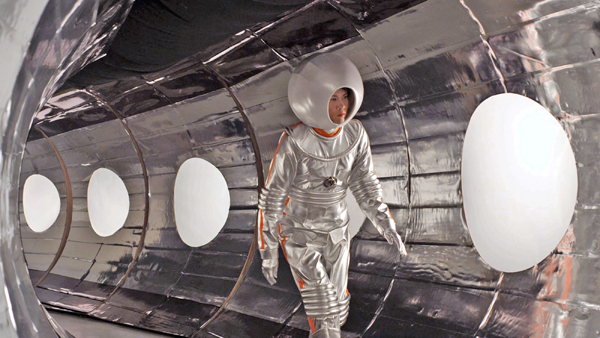 At the end of the tunnel, the vanishing point, a looped video is screened of Wong in spacesuit gear, tumbling and arcing through the air to the opera aria Princess ZhaoJun Crosses the Border.